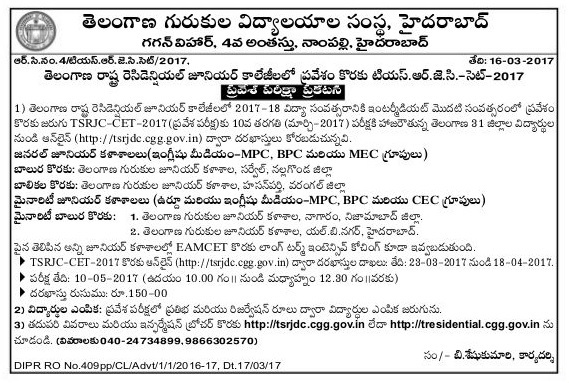 TSRJC CET 2017 Notification ,Results Key,Question Papers,TSRJC CET 2017-Telangana State Residential Junior College Common Entrance Test 2017 will be conducted every year. Telangana State Residential Educational Institutions Society TSREIS officials issued the TSRJC Common Entrance Test 2017 Notification. This TSRJC 2017 Entrance Exam for admissions into regular Intermediate first year courses in its Telangana State Residential Junior Colleges in TS State for the academic year 2017-18. Application form will be started from 23rd March 2017. Hence candidates before applying check the notification in very detailed way. Students who will be applying for exam check the colleges in which they can study their plus 2. Candidates should score good marks to get rank in this exam. Hence have a keen look at syllabus, exam pattern to become familiar. There is separate syllabus for MEC, BIPC, CEC, MPC. Objective type for 150 Marks. It is conducted for two and half hours. Each subject is allotted with 50 marks. Other details like tsrjc hall ticket, answer key will be updated soon after completion of application date and exam respectively.